HelenMari Merritt, DO (center) participated in the STSA 61st Annual Meeting as a Resident Moderator. 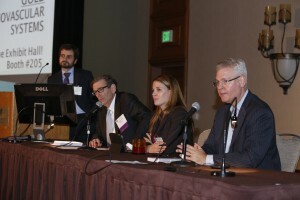 HelenMari joined David R. Jones (right) and Richard L. Prager (second from left) at the moderator table during the First Scientific Session on Nov. 6, 2014 in Tucson. HelenMari Merritt, DO participated in the STSA 61st Annual Meeting as a Resident Moderator. HelenMari is currently an I-6 resident at the University of Texas Health Science Center San Antonio specializing in adult cardiac surgery. HelenMari joined STSA Council Chair and Past President (2013-14), Richard L. Prager, MD, and former STSA Secretary/Treasurer, David R. Jones, MD at the moderator table during the First Scientific Session on November 6, 2014 in Tucson, AZ. STSA recently interviewed HelenMari about her experience at the STSA Annual Meeting as one of the Association’s inaugural resident moderators. 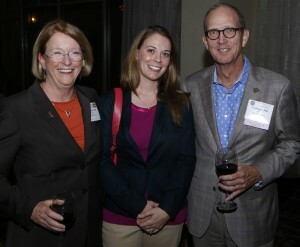 How would you describe the STSA Annual Meeting? I would describe the meeting as the yearly opportunity for regional surgeons to share information, emerging technology and fellowship with each other. There is a well-balanced blend of collegiality, as well as formal scientific interactions. What did you find most valuable about attending an STSA Annual Meeting? The most valuable and exciting part of attending the STSA Meeting was listening to emerging technologies and surgical approaches from cardiothoracic surgeons at all levels of training – from the Giants in the field to residents who may be presenting their work for the first time. What did you find most valuable about participating in the STSA 61st Annual Meeting as a Resident Moderator? Sitting at the moderator table with distinguished faculty and engaging in educational discussion was a really remarkable opportunity. Equally humbling was the warm welcome I received from every member I encountered at the meeting – from the newest STSA members to the President of the Association himself. Would you describe the STSA Annual Meeting as a good forum for residents to disseminate their work? Absolutely. Although there is a distinct focus on worthy academic presentations, the atmosphere is less formal than other larger meetings. And from a strictly chief resident perspective, networking for future jobs is always a welcome bonus! HelenMari Merritt, DO (center), attended the 2014 Residents Reception during the STSA 61st Annual Meeting with Andrea J. Carpenter, MD (STSA President Elect) and John H. Calhoon, MD (STSA President). Were you encouraged by a colleague or mentor to join STSA as a member and/or attend the STSA Annual Meeting? My faculty members – in particular Dr. John Calhoon and Dr. Andrea J. Carpenter – have always encouraged resident participation in regional and national societies. Through their leadership, they model how important professional relationships and collegiality are in the field of CT surgery and inspire the residents to do the same. Abstracts are currently being accepted for the 62nd Annual Meeting, which will be held November 4-7, 2015 at Disney’s Yacht & Beach Club Resorts in Lake Buena Vista, FL. STSA looks forward to again providing residents with the opportunity to moderate general sessions in 2015. Visit www.stsa.org/abstracts to view abstract submission guidelines and access the abstract submission website.